Since the arrival of Chromebooks and Chrome OS, managed devices have always been a part of the landscape. The ability to manage many devices remotely and with relative ease has long been a sustaining reason Chromebooks have fared so well in schools. As Chrome OS continues its expansion into the consumer and enterprise markets, more features are becoming core to the Chrome OS experience. One of those features Google is spending some time and energy getting right is managed devices and kiosk mode. Kiosk mode has been around for a little while and managed devices, as stated above, aren’t really new either. It is the ease of setup that Google has really worked on of late. We’ve taken this new setup for a spin from start to finish and can confirm the overall ease of use in setting up Chrome OS devices as managed kiosks. Additionally, the introduction of Android into this managed kiosk setup has given even more functionality to what Google is calling Purpose Built Devices. With Android apps, for instance, you can have a Chrome OS device set to only run Square Register (or your choice of POS system) at your counter with minimal hassle and maximum control. 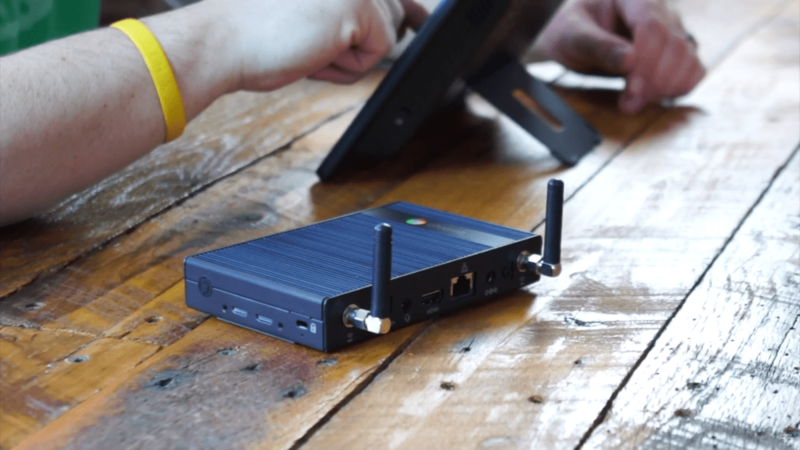 Google has worked closely with AOpen on two devices that are the torch-bearers for this new effort: the AOpen Chromebase Mini and the AOpen Chromebox. Both powered by the last-gen Rockchip 3288, these devices are made for kiosk setups. From their heavy metal bodies and no-frills specs, they both are Chrome OS devices built with things like interactive displays and Point Of Sale systems in mind. Though we don’t have a proper Chrome OS tablet, this new Chromebase is a basically a tablet with a stand, sans battery. The Chromebox is pretty much what you’d expect. With covered power buttons, resistance to the elements, and sturdy builds, both devices are made for public use. At 32GB of internal storage and 4GB of RAM, they aren’t going to blow anyone’s mind. They aren’t that fast. But these devices are Purpose Built. They are made for one thing at a time, and that they do just fine with. Apart from a couple Purpose Built Devices, Google has really worked on the process. Let’s remember, kiosks and small Point of Sale systems are devices likely to be deployed in small businesses like coffee shops or gift shops. Those small businesses may or may not have any use for the full G Suite setup, and using these devices was not possible without it before. Fast forward to today, however, and Google has made a simple way for new users to have a management console set up in just minutes without the need of Gmail accounts, domains, etc. This setup process is referred to as the Purpose Built Device Management Trial by Google, and it gets users set up and working with 2 licenses for 2 managed devices for 30 days. Google provides a full walkthrough as well, and the process gets you a custom Google sub-domain to use during the trial. If you choose to keep it, you simply become a paid customer and continue using your devices as you’ve configured them. If you decide you don’t like it, the account and all settings/files are terminated after an additional 30-day grace period. It really is that simple. No domains to set up, no G Suite or Enterprise accounts required. We stepped through the process in about 15 minutes and were up and running with Square Register on the AOpen Chromebase Mini in no time at all. You may be wondering why you’d mess with all this for a couple Point Of Sale setups. Mainly, it is for concise management. From a central, admin console, you can control what apps are allowed (including Android apps), power up, power down, reboot, and add/remove users on the remote devices. The whole interface is pretty simple, and Google has provided a detailed walk through documentation for each step of the process. We aren’t covering all that here because small changes to this setup process are not only possible, but likely. We’d rather you follow Google’s guides on this as they will be kept most up to date. Speaking of guides, here’s the starting point if you are interested in getting started with Chrome Purpose Built Devices. Keep in mind, though the AOpen devices we mentioned above are built with these functions in mind, any Chrome OS device can be used as a managed and/or kiosk device. So, if you have a few devices around, you can go through these steps and get up and running right now to see if this whole setup could work for your small business.